This is a little different from the pasta I normally eat, but I was feeling blue and wanted something creamy and also was wondering if I could make bechamel with almond milk. And you can, so then I wasn't blue anymore. Bring water to a boil for the pasta. Wilt spinach in a saute pan over medium high heat. Rinse with cold water and let drain. Melt buttah in the saute pan over low heat. Peel and mince the shallot, and saute gently while you squeeze as much water as you can out of the spinach and chop it finely. Add flour and cook for a couple minutes over medium high heat, then whisk in almond milk. Stir and cook sauce over high heat for another couple minutes until thickened. Stir in the nutmeg and chopped spinach, and season to taste with salt and pepper. Meanwhile cook the pasta until al dente, about ten minutes. Drain the pasta and when the sauce is ready, stir about half the pasta into the sauce and put away the rest of the pasta for later. If you have cooked pasta that you put away before, you can just add it right to the pan after sauce is ready and heat through. 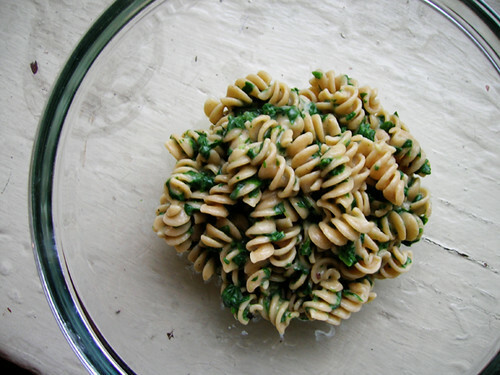 Hint: If you don't add the pasta, then you just have creamed spinach. Which is very good as a side dish with you-know-what.